One of the things I volunteered to do for the Fall Festival fundraiser at the kids’ school was to transform a big cardboard box into a jail cell. The idea is that someone pays a ticket or two to put someone else in jail, and then the jailed person has to pay a ticket or two to get out. Family friendly fun! The problem is, I can’t figure out how to keep it from blowing away when the wind kicks up, which is very often does in Anza. The structure has to be completely collapsible so it can be transported and stored, so the roof comes off and closes on hinges. I could weight the floor if it had one, but I don’t know how to make a removable floor that can be securely attached to the rest of the thing. Ideas, anyone? 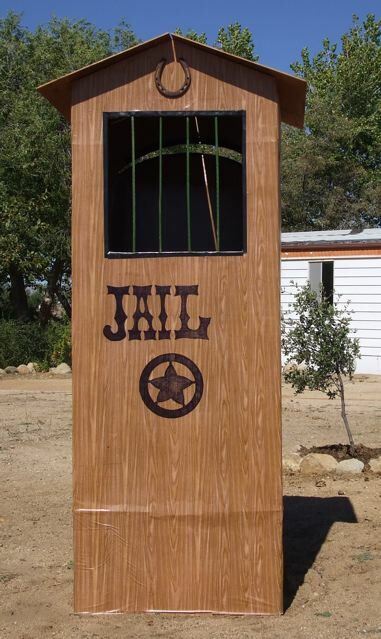 How can I keep my jail from ending up in the next county if the Festival falls on a windy day? Run ductape around the inside bottom with four lengths of cord taped in each corner and then stake them to the ground or tied them to sandbags. Something to that effect? This remindes me for some reason of that picture of you as a ‘haunted house’ when you were little.lol, Remember? How about some PVC pipe inside in a basic frame and some duct tape to attach it? David–staking it is a great idea, but I think the festival is going to be set up on asphalt. If it’s not I’ll definitely look into that. Mia — the box already has a little wood frame around the bottom on the inside, but that hasn’t added enough weight to do the trick. If I had more time to plan and buy supplies I might try pvc filled with wet sand or something heavy like that. Hmmm….